"Boneless chicken breasts marinated in herbs, garlic, oil and vinegar and broiled or grilled to perfection. Dovetailing Tip: Prepare and grill an additional 1 pound of chicken to be used day 2 in Creamy Chicken Alfredo Pasta. In a blender combine the parsley, rosemary, thyme, sage, garlic, oil, vinegar and salt and pepper to taste. Blend together. Place chicken in a nonporous glass dish or bowl and pour blended marinade over the chicken. Cover dish and refrigerate to marinate for at least 2 hours or up to 48 hours. 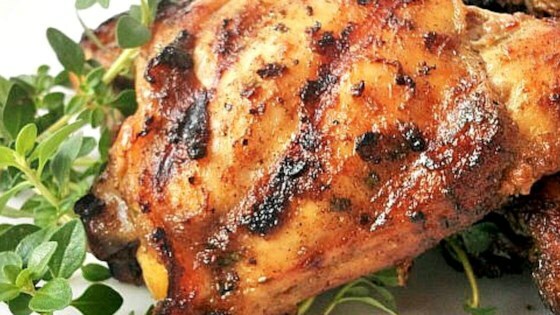 Remove chicken from dish (disposing of leftover marinade) and grill or broil for about 6 to 7 minutes per side, or until chicken is cooked through and no longer pink inside.